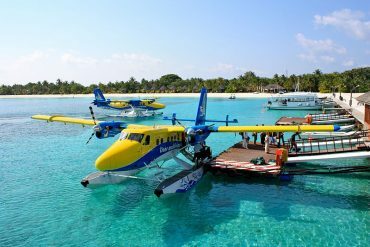 Batam or Bintan - Which is better? 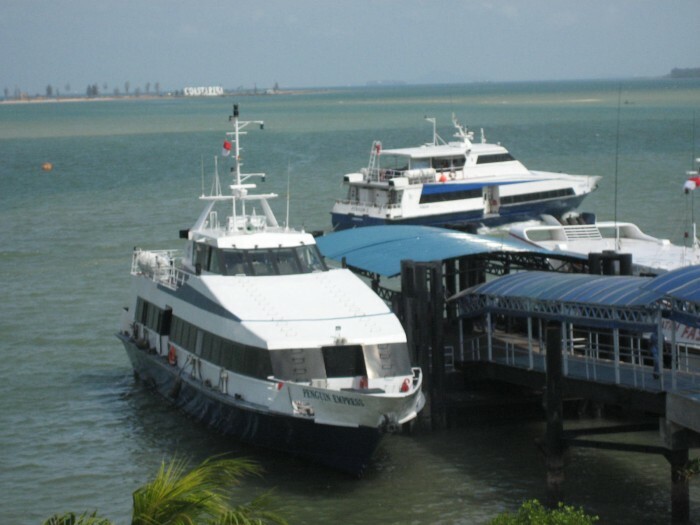 Batam Versus Bintan – What’s The Difference? With 2 Indonesian islands not far from Singapore with very similar names, have you ever wondered what’s the difference between Batam and Bintan? 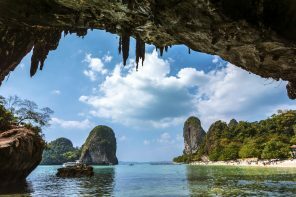 While both are popular holiday destinations for residents of Singapore, we share with you which island to go to based on what kind of island getaway you’re looking for. Here’s a breakdown of whether to stay at Batam or Bintan. If you’re considering holidaying on Bintan or Batam, it’s easy to assume all resorts would be close to a nice beach. This is definitely not always the case. Read to find which are the best resorts with great beaches on Batam and Bintan. Batam is home to a few nice resorts which offer great value for money including our favourites Montego Resort and Turi Beach Resort. 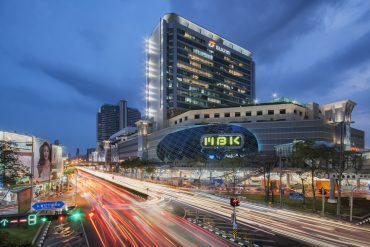 These two hotels will give you an easy getaway from Singapore with nice resort facilities. This contemporary waterfront resort is so Instagram worthy, it’ll have your friends thinking you’ve flown hours away to Bali, but it only took you 35 minutes by ferry to get to this oasis. For a very reasonable price you can enjoy a spacious 1 to 2 bedroom villa (3 and 4 rooms also available) all to yourself most with a private plunge pool. 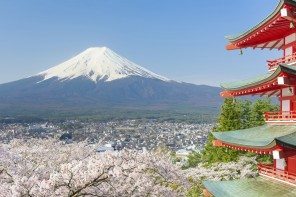 If you ever decide to leave your immense compound, you can chill at the one of the resorts’ pools, restaurants or bars and a shuttle is available to visit Nagoya Hill Shopping Mall. A long time favourite weekend getaway for visitors from Singapore, Turi offers reasonable price rooms for a resort right on the beach. Here you can lounge by beach or pool, take part in different water activities including kayaking or go for a short stroll to the neighbouring resort or golf course. Bintan surpasses Batam when it comes to luxurious resorts and beautiful beaches. 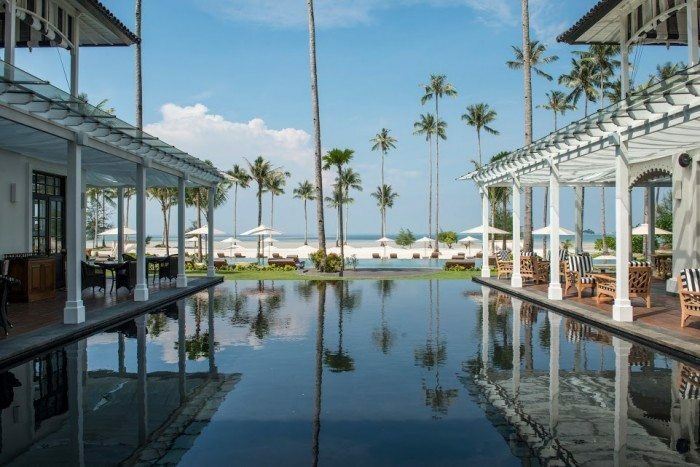 Banyan Tree Bintan has been gracing the shores for a few years and has now been joined by the ultra luxurious The Sanchaya. 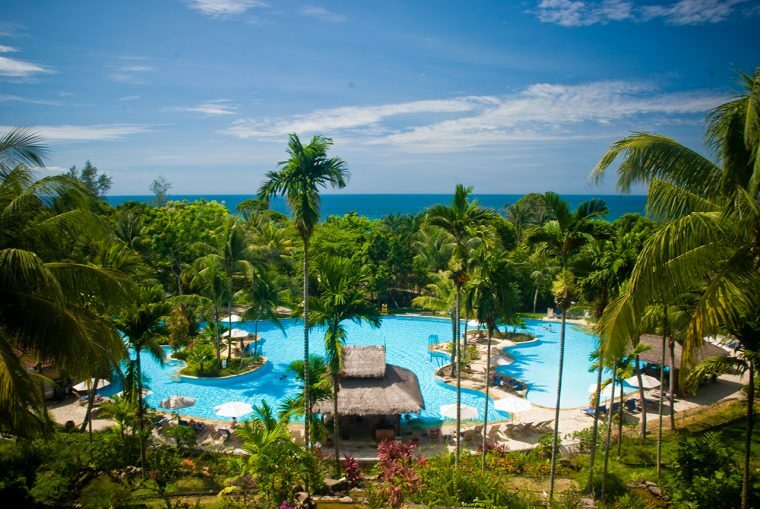 Other resorts to consider include Club Med Bintan. A seriously stylish resort where every room looks straight out of a page of Architectural Digest. Which is not far fetched as the glamorous property has been featured in many prestigious publications. If you’re looking for a decadent getaway at a resort that goes the extra mile to make your stay unforgettable, look no further than The Sanchaya. 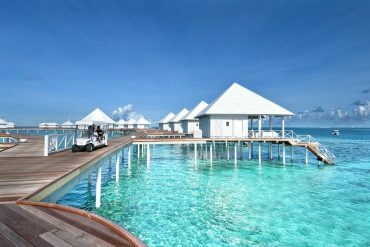 This all-villa resort offers a memorable getaway where you’ll be immersed in nature and pampered on their private beach. Offering a world class spa which Banyan Tree properties are known for as well as complementary yoga, you can return from your vacation rejuvenated. Batam is home to the Tempat Senang Spa which is frequented by visitors from Singapore seeking high quality spa treatments at prices well below Singapore’s high end spas. Bargain hunters can also enjoy incredibly cheap treatments at the spas at the local malls. 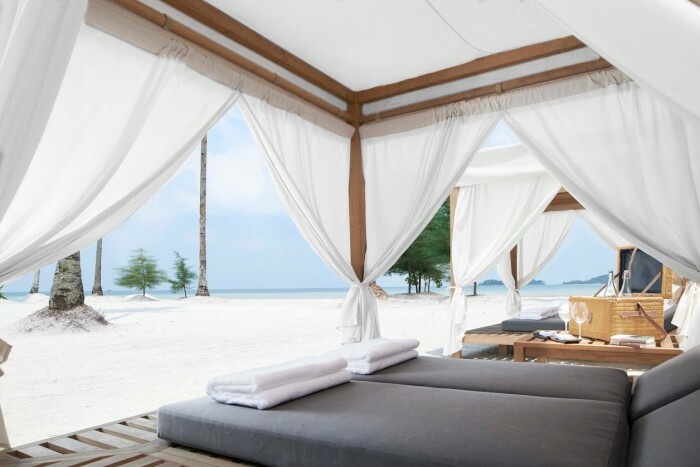 Bintan‘s best spas are located in the islands resorts. Bintan is known for its white sand beaches, but there are also lots of cultural activities to enjoy as well. The stunning 500 Lohan Temple opened in 2017 offers lots of photo opportunities of the 500 life-sized Buddhist statues, while nature enthusiasts will enjoy the mangroves which can be explored on a tour. There is even a traditional overwater village in Senggarang. A short boat ride away from both Bintan and Batam, Penyengat island is a UNESCO World Heritage Site with the Sultan Riau Great Mosque, tombs of kings and castle. In Batam, shopping is the top activity unless you like looking at bridges in which case head to Barelang Bridge. Batam can be reached in as little as 35 minutes from Singapore. And Montigo Resorts Nongsa is only 5 minutes from the Nongsapura ferry terminal. Bintan is further away and will take closer to 90 minutes to reach. Batam is a magnet for visitors from Singapore who visit for shopping at one of the area’s malls. The main draw is prices much cheaper than Singapore. Bintan does have shopping options including Plaza Lagoi Mall, but is not considered a shopping destination. 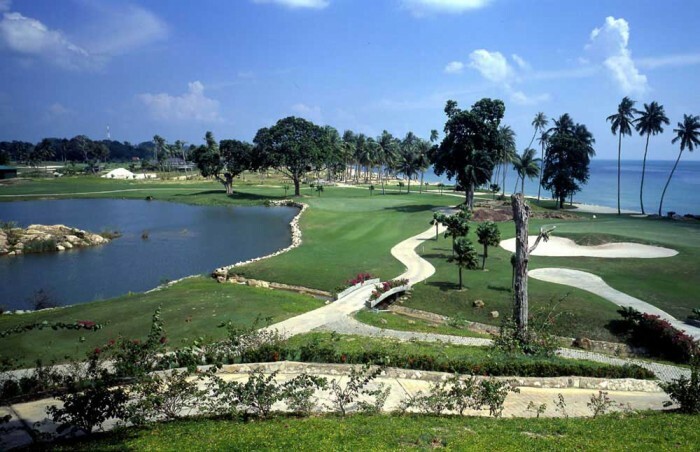 Batam is a hot spot for golfers with too many golf courses for us to list. For those staying at Turi Beach Resort, there are 3 courses within close proximity. Bintan has 2 main golf courses: Ria Bintan which has both an 18-hole and 9-hole golf course and Laguna Bintan which is an 18-hole golf course designed by Greg Norman. There you have it, the difference between Batam and Bintan islands in Indonesia. Which island do you prefer? For a quick and easy getaway from Singapore these Indonesia islands top the list for families. If you’re wondering whether Batam or Bintan is better for families, here’s what each has to offer for little ones. Bintan beats Batam for family friendly activities, but if you want budget friendly, don’t look over Batam just yet! Bintan has had quite a few new projects gracing its shores recently including Treasure Bay. This one stop activity hot spot will keep the whole family wanting to come back day after day. Older kids and adults can enjoy wake boarding, ATV rides, stand-up paddle boarding, mangrove tours and much, much more. 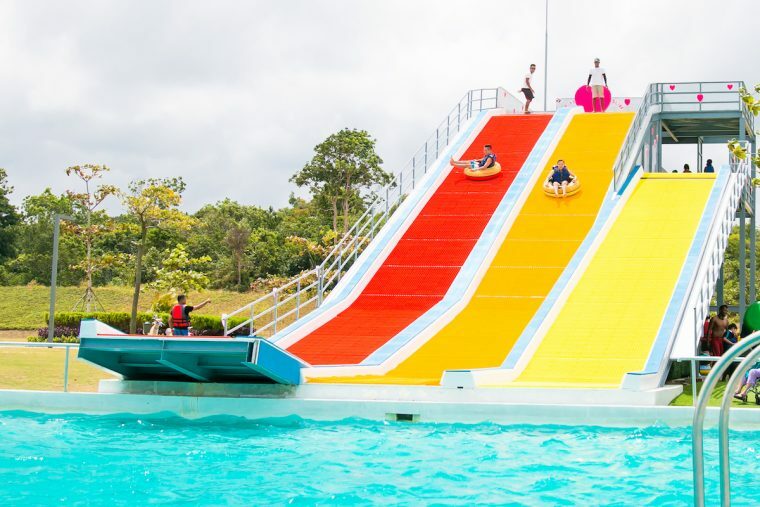 There’s also lots at Treasure Bay Bintan for young kids including a bouncy castle, bumper boats, mini electric ATVs, a slip & slide, water tricycles and Water ZOVB (those huge inflatable balls that allow you to walk on water). The S$10 entrance fee gives you access to the beach, volley ball, bouncy castle and pop-up water slides while all other activities are extra. Check out their prices on their website. To stay close to all of Treasure Bay’s activities, try glamping at Canopi. Check rates on Expedia here. Safari Lagoi is home to rescued and endangered animals including orangutans, sun bears, elephants, crocodiles and an aviary full of birds. Visitors can spend hours exploring the grounds filled with fruit trees and greenery. This local waterpark has waterslides, a lazy river and splash park. Family friendly resorts on Bintan include Bintan Lagoon, Angsana and Club Med. This resort has both very budget friendly rooms and large villas which can sleep up to 10 guests. The resort boasts tonnes of activities for families including badminton, basketball, Karaoke, Mini Golf, batik painting, board games, Foozball, bike tours and archery. Check rates for Bintan Lagoon here. Angsana sets itself apart with an onsite Marine Conservation Lab which at times releases sea turtles so the kids can learn about nature while on vacation. Other facilities include a kids club and water sports centre. Check rates for Angsana Bintan here. Batam is full of well-priced family friendly hotels and all villa resorts which offer extra space for active families. Just be prepared, many of the cheaper hotels and resorts are run down and in dire need of a renovation. 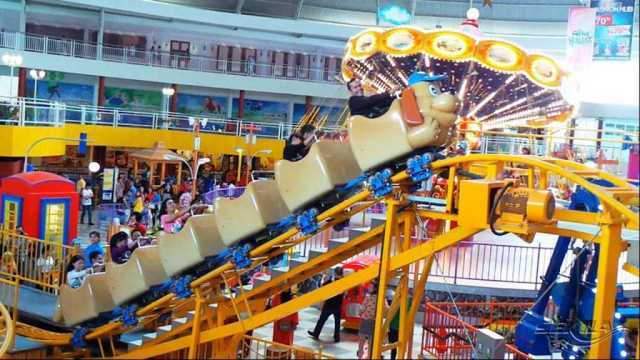 Kids will love the carousel, bumper cars, rollercoaster and multitude of fair rides at Funworld. Best of all you can buy a wrist band to give them unlimited access to all rides for hours of fun. While we don’t recommend staying at Harris because of the quality of rooms the hotel and surrounding area has lots of activities for kids to enjoy even if you aren’t staying there. Activities include a flying fox, kids club, cable ski, bowling, paint ball, go-karts, watersports and more. 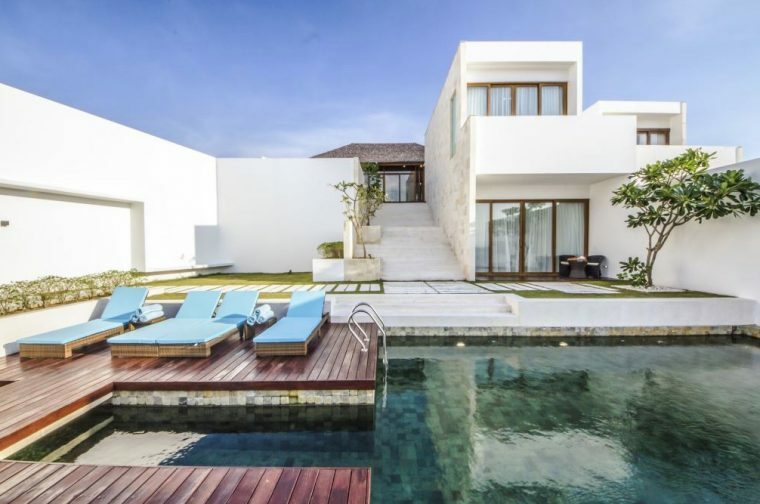 Montigo is perfect for families because of the oversized multi-room villas with private pools. 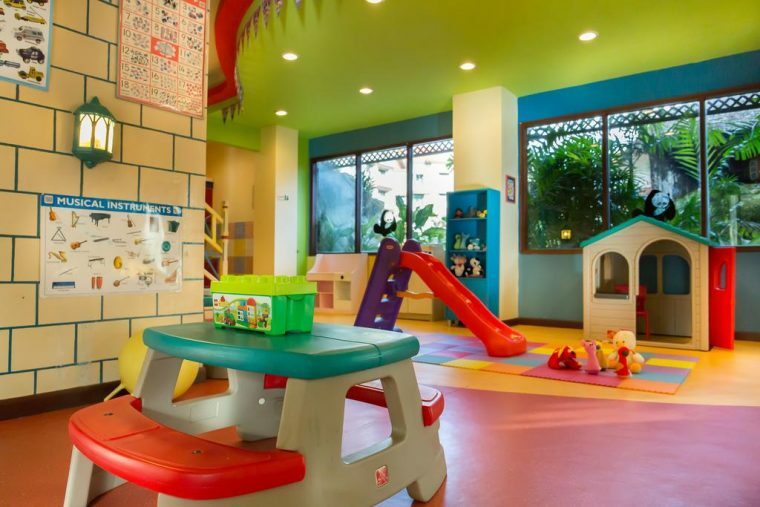 Active kids will love all of the extra space to run around and even the on site kids club. Families looking for a wallet friendly getaway will enjoy a stay at Holiday Inn Batam. A decent resort that offers large well priced rooms and onsite activities for the little ones. Kids can spend their time at the kids club or sliding down the onsite waterslide. Other family friendly activities include bike rentals, ping-pong, karaoke, a pool table with more activities available down the street at Harris Waterfront.